Root Canal Costs - Why Is Root Canal So Expensive? Why Root Canal Costs So Much . . .
. . and why the cost of root canals depends on the tooth! Root canal costs are frequently among your first thoughts when you find out you need a root canal - alongside your worries about getting root canal at all! IF YOU ARE WORRIED ABOUT GETTING ROOT CANAL, I suggest you take a look at my SPECIAL page, Molar Root Canal. Hopefully I can put your mind at rest! OK, back to root canal costs! Put very simply, the cost of root canal is lowest for front teeth, and goes up as you move towards the back teeth. This because back teeth are more complicated than front teeth, and take longer to treat. Front teeth have straight roots, which makes root canal procedures easier. The space to be treated inside the tooth is also larger than it is in back teeth. Again, this makes a front tooth relatively easier than a back tooth. Side teeth frequently have TWO roots, and the space inside the tooth is smaller. This makes side teeth more complicated than front teeth. Back teeth (molars) usually have THREE roots, and sometimes FOUR or FIVE root canals inside them. 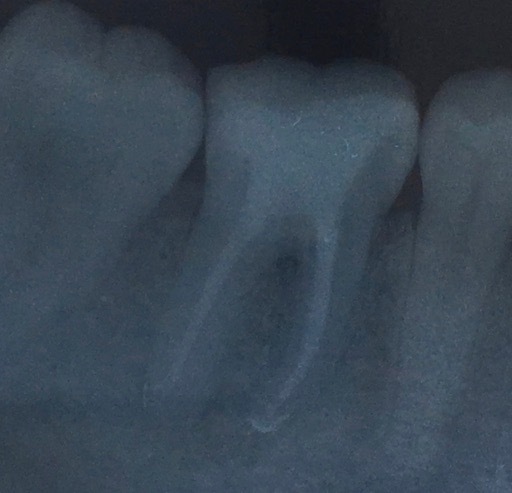 The spaces can be tiny, and the root canals are usually also curved or bent. Molars are the most difficult to treat, and take much longer for the dentist to do properly than front or side teeth. For more information about this, go to molar root canal. The root canal price will also depend on whether it is done by a general dentist or by a specialist (an "endodontist"). An endodontist will have extra training and experience, particularly of difficult cases. This extra training can take up to THREE YEARS, on top of the training to get a dental degree in the first place! ALSO, the specialist will have more sophisticated equipment to help with difficult cases, such as operating microscopes costing $10,000 or more. SPECIALIST EQUIPMENT IS EXPENSIVE! Of course, the specialist will charge you more, to cover his own expenses in setting up his office. And WHERE (ie. which town or city) you get a root canal done will also affect the price; a big city office will be more expensive than an office out-of-town, or in a rural location. Another thing to be aware of when calculating the cost of root canal is additional treatment AFTER the root canal is finished. Front teeth are usually sealed up with a normal filling, but back teeth frequently need a crown (a "cap") to make sure bacteria don't get in. This can double the cost to save the tooth! BUT it will still be cheaper than getting the tooth out and having a fixed bridge or an implant. One thing is for sure; paying MORE doesn't necessarily mean that you get a better (longer-lasting) job. Unfortunately this makes things even more complicated for the patient! What to do? Here is my suggestion: phone at least five dental offices in your area and ask each of them the same thing. Tell them you have been told that you need a very difficult root canal on an upper molar, then ask which endodontist they refer to for complex cases. See which endodontist is recommended the most! As a very rough guide, a root canal on a front tooth can cost from $300 to around $500. On a back tooth, (a molar), the cost of root canal will be about three times as much. Root canal costs vary a lot between dentists, countries and which tooth needs treatment. By phoning around a number of offices and asking for recommendations, you should end up getting the best job at a reasonable price.